New Circus Skates reissue graphics coming soon! 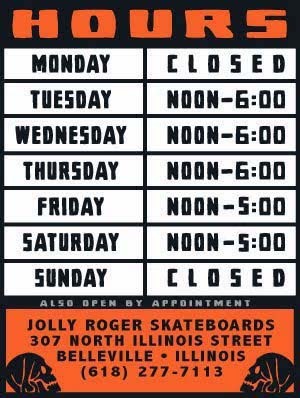 For those who didn't know Jolly Roger Skateboards was at one time Circus Skates. Back in 2001, before Belleville had a Hillbilly Bombshell, Plan Nine, or ICH Skatepark, there we were. We opened up just before the Belleville Skatepark was built. Somehow we slowly morphed into Bellevilles first indoor skatepark, the Big Top Skatepark, and the rest is history. We are always getting requests to reissue some of our old graphics from the Circus days. So we figured it would be time to start looking through the box of old graphics that we did and see what happens. 2012 is exactly 10 years since our most popular "Circus Skates - Dead Clown" graphic was first released so we figured why not start there and reissue it. These decks should be in stock in about 2 months. In the meantime we are going to be printing a variety of Circus graphics on various apparel.